Dow Jones News Fund interns spent 10 days honing their skills at the University of Texas workshop. Front row: Maribel Molina, Laurence Leveille and Samantha Clark. Second row: Emily Siner, Rachel Stella, Griff Singer (faculty), Natalie Webster and George Sylvie (faculty). Third row: Bradley Wilson, Beth Butler, Amy Zerba (all faculty), Danae Lenz, Carrie Blazina and Forrest Roth. Back: Brooks Johnson and Ashley Rene Davis. Eleven college students and recent graduates are headed to paid copy editing internships on daily newspapers after completing 10 days of intensive preparation at The University of Texas at Austin. The Dow Jones News Fund, a foundation of the Dow Jones Company, and participating newspapers and new media services work together to fund the competitive national program. More than 600 students applied for the program. Applicants were required to take a test and complete an extensive application before being considered. 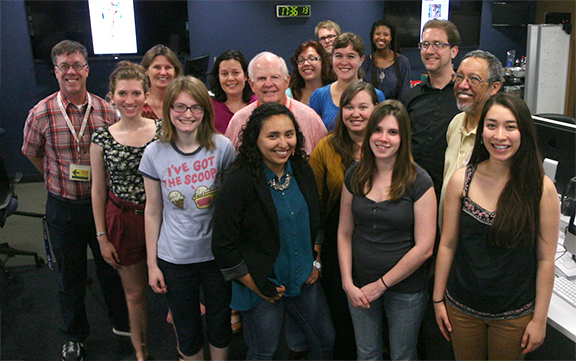 The School of Journalism at UT Austin, one of five pre-internship training sites for print and online copy editors and designers, has been part of the News Fund program since 1998. Participants in the UT workshop were involved in newspaper copy editing, design and production assignments and operated a parallel online news operation. Newspaper professionals, visiting faculty and UT journalism faculty moderated the sessions in this 16th residency program at UT Austin. In the latter half of the pre-internship training, participants produced three issues of a live, model newspaper, the Southwest Journalist, as well as a companion online product, swjournalist.com. The Austin American-Statesman provided printing services for the newspaper. Rachel Stella, Lewis University, The Tribune, San Luis Obispo, Calif. They will serve internships of 10-14 weeks. Grants from the News Fund and contributions from participating newspapers cover the cost of the participants’ pre-internship training, to include housing, meals, transportation and instruction. Participating newspapers also pay interns a weekly wage for their work during the internship. Students returning to their universities after the internships are eligible for a $1,000 scholarship provided by the News Fund. Leading the UT workshop were S. Griffin Singer, director; George Sylvie, assistant director; and Lourdes Jones and Sonia Reyes- Krempin, administrative associates of the School of Journalism. Faculty included Beth Butler, assistant workshop director, from Kent State University; Bradley Wilson, assistant professor of journalism at Midwestern State University; Amy Zerba, a staff editor of The New York Times; Linda Shockley, deputy director of the News Fund, Princeton, N.J.
Drew Marcks, senior editor of the Austin American-Statesman, coordinated the interns’ visit to that newspaper. Other newspaper training centers were at Temple University, the University of Missouri, Pennsylvania State University and the University of Nebraska. Digital journalism workshops were held at Arizona State University and Western Kentucky University, and a business reporting workshop was conducted at New York University.